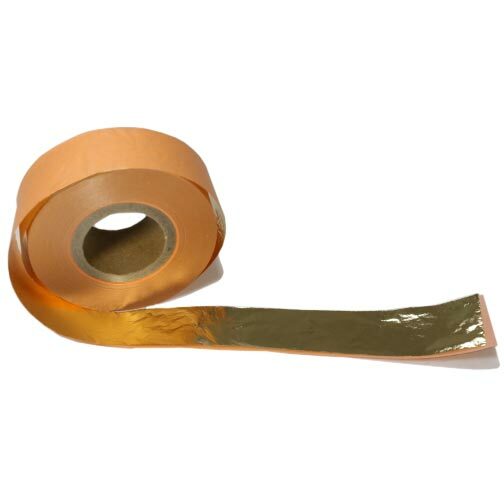 Imitation Gold Leaf is made from copper and zinc, and is frequently referred to as Dutch metal leaf, metal leaf, and brass leaf. Imitation gold leaf is much thicker than genuine gold leaf, and can be gently handled with clean, dry and oil-free, hands. It is closest in color to 23k gold leaf. 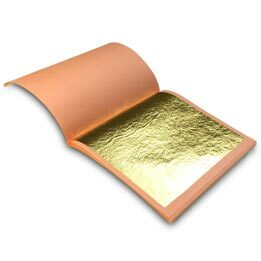 Imitation Gold Leaf is available in both loose and transfer/patent leaf. Rolls are also available. The leaves are 6-1/4” square and are packaged in books of 25 leaves. Imitation gold leaf will slowly tarnish, and should be sealed to prevent oxidation.